I'm not here to judge because I think we're all guilty of not cleaning our makeup brushes as often as we should. Earlier this summer Anisa International, known for their innovation in cosmetic tools, package design and manufacturing capabilities, shared a survey that recognized the need to educate everyone on the importance of having a consistent brush cleaning routine. While reading the survey results, I was a bit shocked to read that a whopping 61% of women clean their makeup brushes less than once a month or not at all. While it's a cumbersome task, we must schedule it into our calendars and actually make an effort to do this at least once monthly, if not more often. Check out my video for a quick way of cleaning your makeup brushes using Anisa International Brush Pro Wipes. It's recommended that you still do a thorough cleanse once a month, but these wipes are a great way to get the job done quickly. 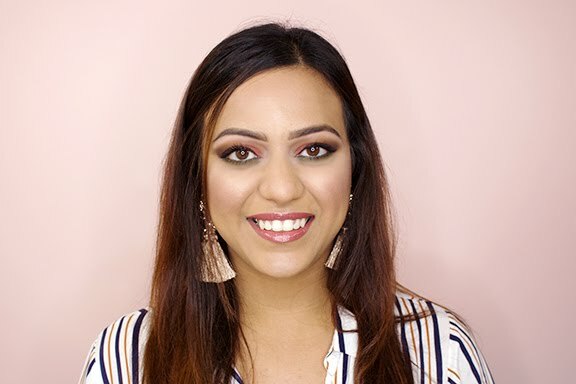 I had the opportunity to interview Anisa Telwar-Kaicker, founder and CEO of Anisa International, about the survey findings and thought you might find her answers to my questions helpful! Me: How often should you clean your makeup brushes? Anisa: We recommend a weekly or bi-weekly routine in addition to a monthly deep clean. Whether you’re using wipes, sprays, shampoos or oils, it’s essential to do a full cleaning on a regular basis. Me: How much time should you spend cleaning each brush? Anisa: In our survey, we found that 22% of women avoid cleaning their makeup brushes because it takes too long to clean or dry. What many women do not realize is that brush cleaning does not have to be a difficult, time consuming process. In fact, with new products on the market today, brush cleaning can be done in just minutes. Our company recently partnered to develop and launch brush cleaning wipes that cut the cleaning and drying time and makes the whole cleaning process easier for women. These individually wrapped, disposable wipes combine ease-of-use and convenience, and brushes dry in minutes – ideal for the day to day cleaning routine. Me: What is the proper way to clean your makeup brushes? Anisa: For a deep cleaning wash, we recommend using a cleaner designed specifically for brush heads. Gently run the brush under water, massaging the cleaner through the bristles. Do not soak your brush as the water can damage the ferrule – the metal piece that holds the brush fibre in place – leading to fibre fall out. Once the soap residue is rinsed clean, lightly pat dry on a towel to remove the excess water using a similar motion as with the brush cleaning wipes. Carefully reshape the brush head and lay flat to dry. Me: What is the downside to not cleaning your brushes? Anisa: Overtime, makeup product residue, oil and dead skin can collect on brushes, creating a breeding ground for bacteria which can be harmful to your skin. Additionally, when dirty, the brush fiber can’t pick up the makeup as effectively affecting the application of your product and impacting your ability to create a certain makeup look. Our skin is a vital part of our overall wellbeing so it’s important to keep it healthy. Many women don’t realize the correlation between healthy skin and cleaning makeup brushes. In addition to overall hygiene and skincare, regular cleaning protects your beauty tool investment and maximizes the effectiveness of your makeup products. Hope you found this video and post to be useful - I personally found the survey results and Anisa's answers to be extremely helpful and wanted to share them with you.